MOSCOW, Russia -- Russia will introduce a food embargo against Ukraine next month over Kiev's trade deal with the EU, Prime Minister Dmitry Medvedev said Monday, extending punitive measures already in place against Western countries. Russian officials steamrollered tonnes of Western food outside the city of Novozybkov in August 2015. 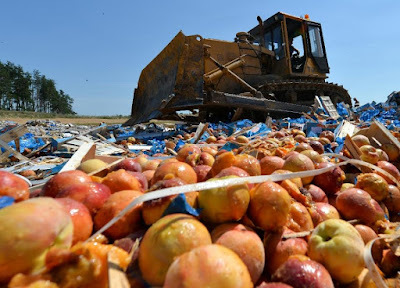 The "Evil Empire" destroys food, while many Russians don't have enough to eat. "These measures will be extended to Ukraine too," Medvedev said at a government meeting. "I have just signed the relevant decree." A free trade deal between Ukraine and the European Union is set to enter into force from January 1 as part of a broader agreement that helped sparked the current crisis between Kiev and the West on one side and Moscow on the other. Russia has repeatedly expressed concern that Ukraine's free trade agreement with Brussels may flood its market with European goods, and months of three-way talks with the EU to smooth the transition have yielded no results. President Vladimir Putin last week ordered a suspension of Russia's 2011 free trade agreement with Ukraine. The move will effectively raise customs tariffs for Ukrainian exporters to Russia by seven percent. "We must protect our market and our producers and to prevent import of products masked as Ukrainian that are from other countries," Medvedev said. "There have been several rounds of talks. They did not bring any result," he added. "Neither Ukraine nor the European Union are ready to sign a legally binding agreement which would take into account Russia's interests." Moscow's slapped a ban on a large array of agricultural produce from the EU and other nations inluding the United States in 2014 in retaliation for Western sanction against Russia over its meddling in Ukraine. Medvedev's announcement came as European Commissioner for Trade Cecilia Malmstrom was engaged in the latest attempt to reach common ground on the issue with Russia's Economy Minister Alexei Ulyukayev and Ukrainian Foreign Minister Pavlo Klimkin in Brussels.